Tis the season to enjoy cold, sweet treats. Tis the season to find refreshment in a frozen snack after a hard day of work or play. Tis the season to drip syrupy red or blue food dye down the chin, staining the teeth, the tongue, and the swim shirt in the process. No, wait. Not that last one. Let’s skip the food dye and syrupy fake sweetness of high fructose corn syrup, and instead enjoy a real food treat. Although do feel free to let this Strawberry Creamsicle melt and drip down your chin. After all, what’s summer without messy, sticky chins and swim suits? Seriously, you should watch me eat a slice a watermelon. It’s like I’m a three year old, slurping and grinning and ignoring the watermelon juice as it runs all the way down my neck while I stand at the kitchen sink taking bite after bite. Hey, there’s no shame in enjoying a treat while ignoring the napkin. Sometimes you just really don’t know what to say or do with the things I tell you about myself, do you? Oh c’mon. Live a little. 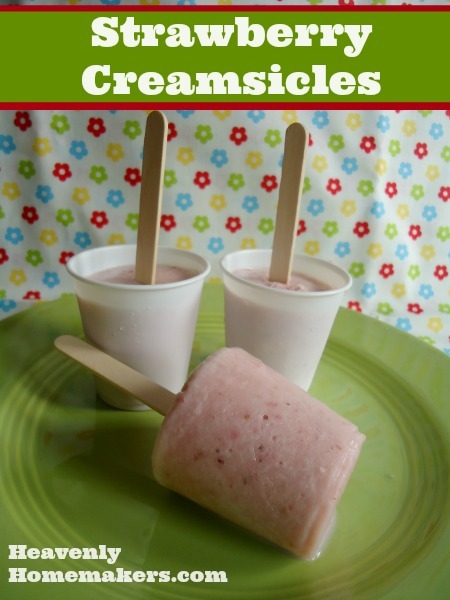 Grab some watermelon and make some Strawberry Creamsicles. Grin and slurp. Be a kid again. Nothing fake – all natural sweetness, just perfect for a summer treat! I can’t think of anything I’d rather have running down my chin. 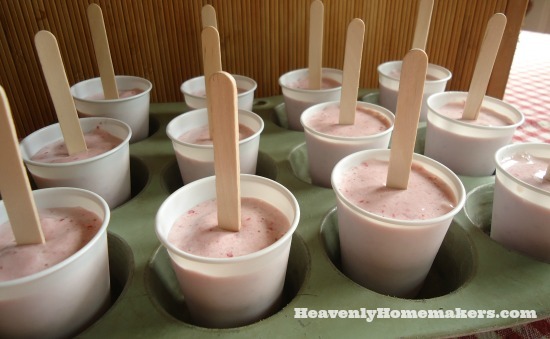 We make smoothy pops with yogurt, ripe banana, seasonal fruit, and a little sweetening if needed ( cherries, peaches, strawberries, etc.) The kids love them and I love that we can even give them to the baby depending on the fruit. Definitely! I’d probably go with 1 Tablespoon honey. Perfect timing! I just picked up a flat of strawberries this morning and was coming to look up a strawberry rhubarb recipe, adding this one to the list now, too! I would like to know also, can you use Honey ? Do they come out of the little plastic cups easy, or is there a certain way to get them out ? Can you use the paper cups also ? Have never made these and do not have the molds either…..
Can we please have an answer please…..if not from Laura, someone who had made them….. These sound delicious! We’re going to pick strawberries on Monday, so I’ll have to give these a try! Would this work with oranges for a traditional creamsicle? Yes, in fact I have a variation of this recipe almost ready to share for an Orange Creamsicle. Watch for the recipe in a couple of days! What a brilliant idea! I can imagine the strawberries taste delicious with the coconut milk – what a combo. Thanks for the recipe. I have frozen raspberries & blueberries & this are going to be made TODAY! Thanks for sharing such a simple idea. Love my stevia too!!! We just made ours with blueberries (out of strawberries) and we added a spoonful of lemon curd. It tastes really good – hopefully they still will once frozen! Made today with honey and they were great!!! Thanks for recipe! My boys loved them and good for their bodies! Made these for the first time this weekend, and my boys have enjoyed them the last two afternoons! When my five year old asked for a second, I said sure! Why not when it is good for you? Looking forward to trying with blueberries too. Thanks for great, easy recipe!